Windy is here to help save lives or property by informing others about severe weather phenomena or state of our Earth's climate. Therefore we are proud to present to you Windy Articles. Windy Articles should help our users and other media to inform about these events, but not only that. We would like to educate others about weather and its dangers. You can use Windy Articles as a publication platform and start writing your articles too, here is how. 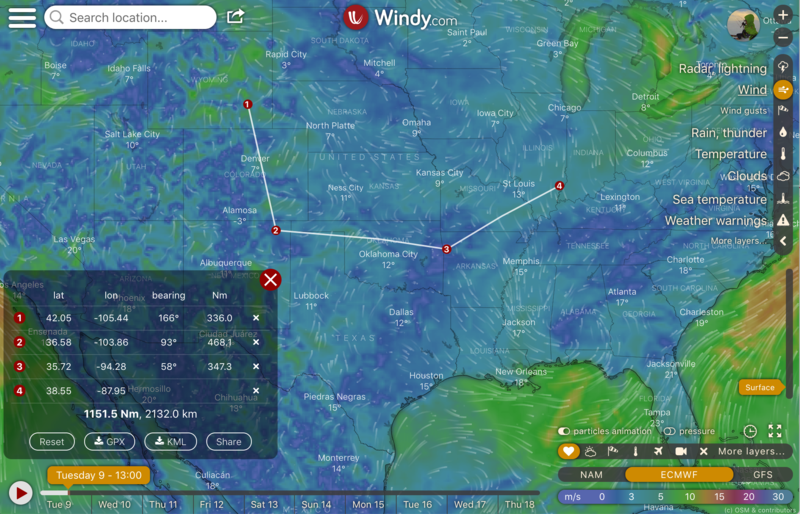 We have brought back the possibility to open Windy and force to display the weather picker in the middle. Just add d:picker to one of the URL params and it should work. We have improved the distance & planning tool, so now you can export your track in GPX or XML. And we have also fixed the timeline bug, so your track can cross the timeline. A lot of work on this release was done by Ivo, Marek, Milan, Filip and Martin. So enjoy Windy 19, report any issues and stay safe! THANKS for all your hard work Ivo, Marek, Milan, Filip and Martin (and others), it is very appreciated. I run Windy now on my big LapTop, it shows me the sunrise time in La Coruna today to be at 5am! Using a different tool gives the sunrise time at 8am. Even if one of the tools does not use the DST the 3 hour difference is unexplainable, while looking out of my window confirms there is a bug in Windy. @Gkikas-LGPZ Very strange: it is OK now on mine too! Well, I caught it: this happens when I try to see the forecast for a point at sea. Maybe this issue should be in a separate thread, not the version 19 announcement? Exceptional work as always. Congratulations! Would be nice if Windy automated that link-creation process. Thank you for the update to the planning tool. I come from Hong Kong and know that windy has become one of the famous topics in reporting on weather forecasting when a typhoon is approaching. Keep it up. Thanks a lot Ivo, it's a very usefull work for all of us. Muchas Gracias por esta excelente y confiable aplicación. A los creadores, les deseo que sigan mejorando y actualizado cuando se requiera. Saludos desde Apizaco, Tlaxcala. México.